Sustainable Archaeology is a digital archaeological research facility and repository making Ontario’s archaeological heritage accessible to all. Dedicated to ensuring a sustainable future for Ontario's archaeological heritage. This winter, SA: Western has had two Work Study students from the Department of Anthropology, Kayley Sherret and Connor Schmid, assisting with the day-to-day activities at our facility. We have certainly kept them busy with everything from collections management to researching file formats for the associated records in our Informational Platform. We've asked them to test the database, move boxes, repackage collections, label shelves and scan documents. But in the midst of that hard work, we've also asked them to familiarize themselves with some of SA's equipment and help us develop some of our user manuals. This has given them the opportunity to interact with SA Research Associates and Technicians, to apply some of the knowledge learned from their coursework, to do a little extra research outside of their curriculum and - hopefully! - to have had a little fun. 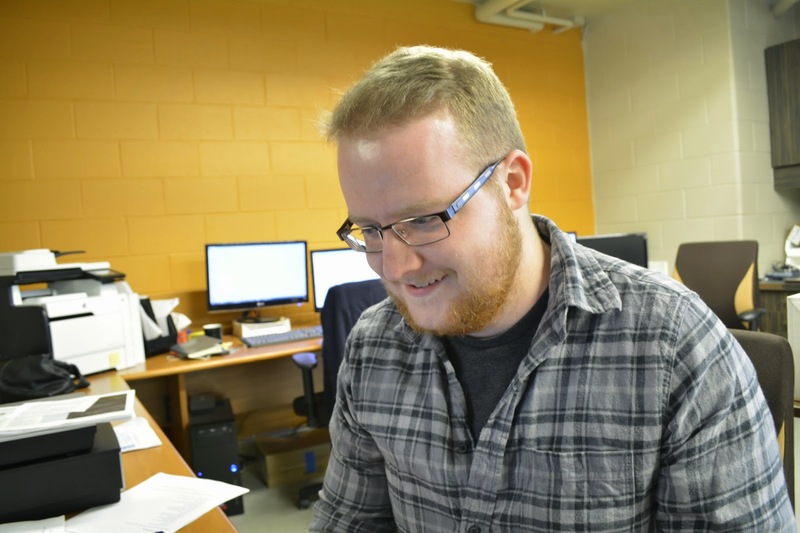 Please enjoy the following blog post, written by Connor Schmid. In the summer of 2014, as part of a re-boxing and collections management project, the Museum of Ontario Archaeology found a discreet box in their storage room. It contained two rings and a metal pendent with an unreliable context card. Dr. Chris Ellis of Western University identified these as Jesuit rings and a devotional medallion and affirmed their rarity. These are known to have been distributed by Jesuit Priests to the local people at Missions in the 17th century and were widely traded (Cleland, 1972; Smith & Mattila, 1989). 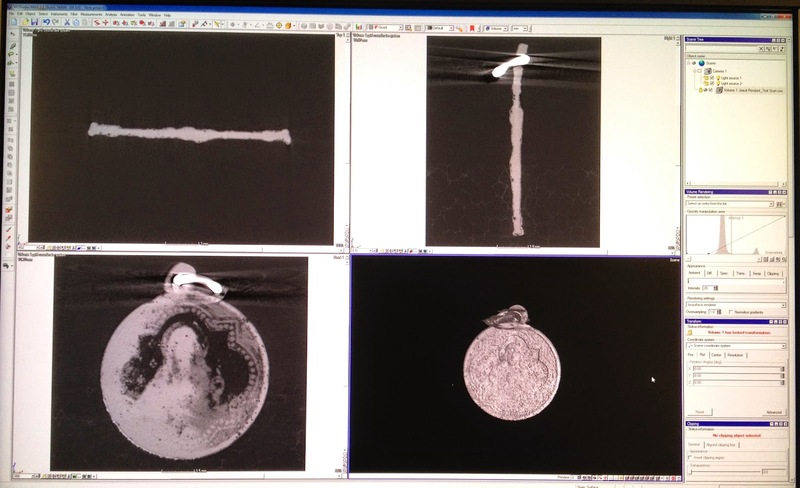 Sustainable Archaeology: Western work-study students have used several techniques to examine the rings and medallion, including: photography, 3D scanning, and microCT scanning. These Jesuit artifacts have given us an opportunity to test our setup and skills with the SA digital photography equipment. First, we carefully mounted the artifacts using foam blocks to get a good view for our camera. We then adjusted the lighting to capture the small details on the artifacts. In this case, we used two light sources – one fixed to provide a constant light source, and the other adjusted to play with the shadows cast by the artifact. Once our lights were set up close to where we wanted them, we used image capture software (Nikon Camera Control Pro2) to manually adjust the camera settings, ensuring the proper focus and exposure for the photo. We then took a few shots of the artifacts, adjusting lighting, zoom, or camera position as needed until we got a photograph we considered excellent quality. Eventually artifact photos such as these will inform how photography is used in the SA Informational Platform. While photography is useful for portraying a simple 2D image of an artifact, rarely do such images capture the entire artifact as it is in real life. For example, getting a complete picture of our two-sided Jesuit medallion is difficult, as we must take two pictures of either side, rather than an image that can display the entire three dimensional artifact. 3D scanning allows us to take a complete scan of an artifact, making a digital representation that can be rotated and examined as a real artifact would. The 3D scanners from 3D3 at SA use white light to capture a series of images that can then be combined into a three dimensional digital model. With help from our 3D Imaging Specialist Nelson Multari, we were able to take several scans, and then combine them in Flexscan3D, a model editing program, to make a 3D image that is an accurate representation of the physical artifact. Any “holes” in the model where the scanner couldn’t see – say, a shadowy area – were filled in using editing software, giving us the final digital version of the 3D scan. 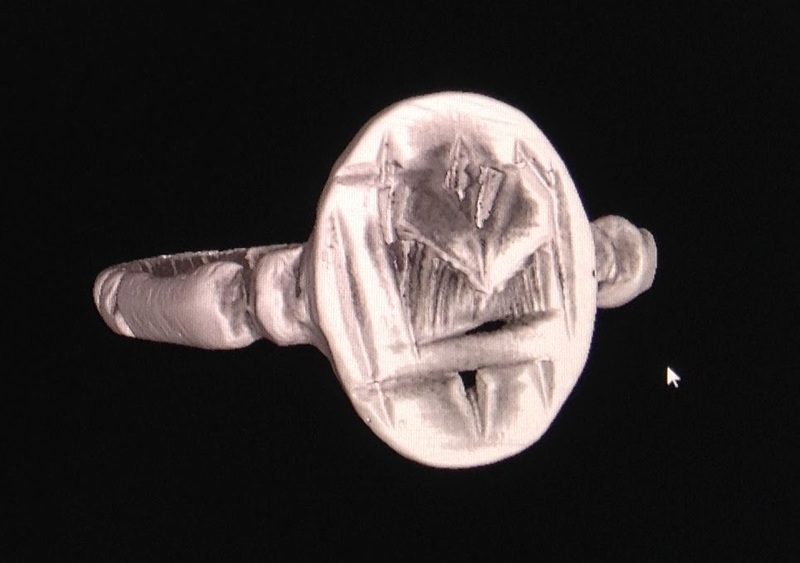 While the design on the rings can be viewed in greater resolution in our 2D photograph, the 3D scan allows us to orient the artifact and examine portions not captured by photography, such as the inside of the band. 3D scanning gets us a digital representation of the exterior of the artifact, but what if we wanted to examine the interior structure? You could use an invasive method, something like thin sectioning that destroys a portion of the artifact – or, you could use SA’s microCT machine and scan the interior of the artifact using X-rays. MicroCT uses X-rays to scan cross sections of an object that can be used to create a 3D virtual model of the original (Nikon). The ‘micro’ in microCT refers to the size of the cross section taken – in this case, each cross section can be in the micrometre range. This type of scanning allows us to create a 3D representation of an artifact that includes the interior structure, making it easier to discern such attributes as method of production, artifact composition, or even viewing fine details that have been obscured by corrosion or decay. 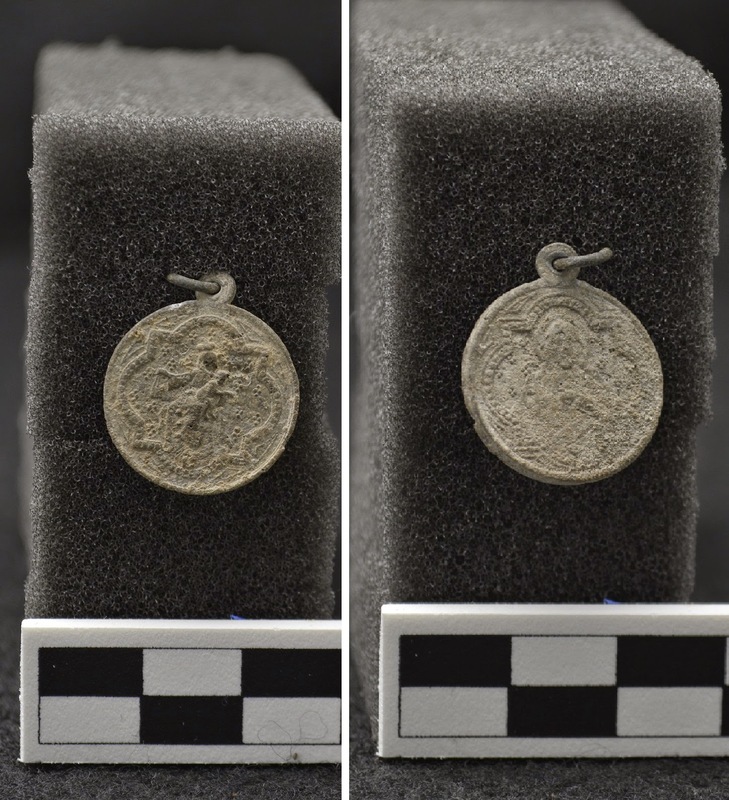 MicroCT scanning showed that one of the rings was made of a very dense material, and that the metal hoop link at the top of the medallion is composed of a different metal than the rest of the artifact. We have had a tough time associating these artifacts with any particular site because our rings and medallion were found in a box that had included little context on the finds. 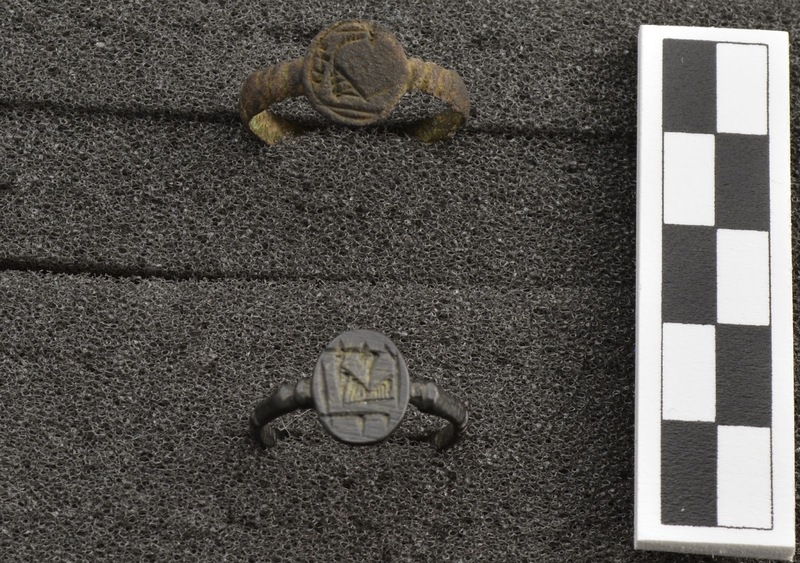 Some detective work revealed that at least one of our rings is from the Omand Site on Christian Island (Smith & Mattila, 1989), associated with the Jesuit St. Marie II mission from the 17th century. Unfortunately, the second ring and medallion have no associated context. The “L-Heart”motif was common on devotional rings from the Jesuit order, with L possibly representing St. Loyola, the founder of the Jesuits, and the heart representing affection directed to that saint (Fitzgerald, Knight & Lennox, 1994). Articles on the methods of production of Jesuit rings gave us an idea of what features a completed ring should have – such rings were cast as one piece, with the design being engraved after casting (Cleland, 1972). 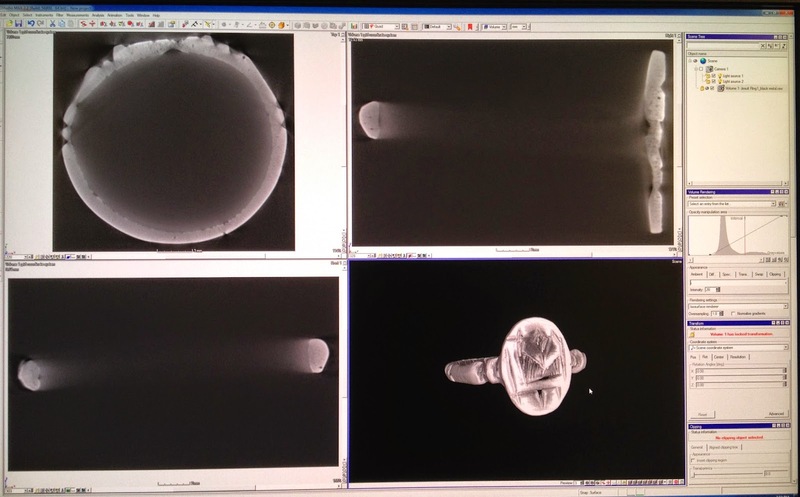 Our microCT scan revealed that the rings had features that were consistent with other descriptions of how authentic rings appear. The microCT scan has also shown that our rings and medallions are composed of different metals, based on the density of each artifact. Combined with photography and 3D scanning, we can create a better representation of these artifacts for others to view than we could using only description or photography. Cleland, C. E. (1972). From Sacred to Profane: Style Drift in the Decoration of Jesuit Finger Rings. American Antiquity, 37(2). 202-210. Fitzgerald, F.R., Knight, D.H., Lennox, P.A. (1994). Catholic Devotional Items from 17th Century Ontario Archaeological Sites. Arch Notes, 94(5). 9-19. Smith, D.G., Mattila, H.U. (1989). French Jesuit “L-Heart” Finger Rings from Christian Island. The Palisade Post, 10(3). 5-6.